Learn how to plan the perfect privacy fence! Every great, high-quality installation requires planning. Residential fencing is one home improvement project that involves talking to your neighbors, your homeowner’s association, and sometimes even your municipality to make sure that your path is completely clear for installing your new fence. Before you get started, here are some tips for planning your privacy fence installation. 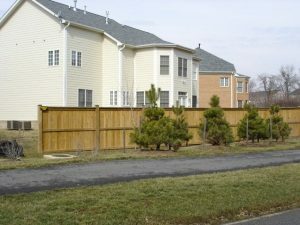 Privacy fencing is a broad term used to categorize the style of fencing that helps limit the view of the general public from your property — this includes limiting the view from your neighbors and people who happen to walk throughout your neighborhood. Having a full understanding of why you want privacy fencing will help you narrow down your choices when it comes to material and style. Do you want to limit eavesdropping? Maybe you want to even block the view of your neighbor’s messy yard. Answering these questions will point you in the direction of the best privacy fence for you. Determine the size that you’ll need your fence to be to provide a sufficient amount of privacy. Take measurements of the area surrounding your property so that you’ll have some rough estimates to work with. Next, you’ll need to determine what your budget is so that you’ll know what options are available to you. Put some extra to the side for unexpected changes and needs for more or different materials. To save the most money, invest in some inexpensive materials and invite some handy friends over to install the fence. Every type of available fence material comes with a list of pros and cons. The cons that you can deal with depend on your lifestyle, the region in which you live, and your budget. Aluminum is durable and doesn’t require much maintenance but isn’t the best for providing privacy. Vinyl fencing has higher initial costs but provides excellent longevity. Wood is known for its classic look; however, it requires a lot of treating and maintenance over the years. Steel is strong, durable, and heavy. You’ll likely need professionals to help handle and install steel fencing. This entry was posted on Friday, July 27th, 2018 at 11:30 am. Both comments and pings are currently closed.